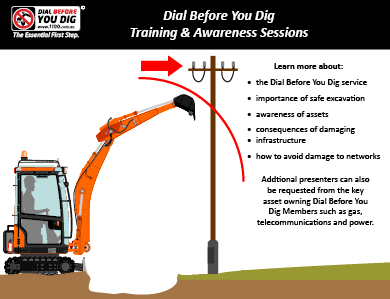 Dial Before You Dig Qld offers FREE network Awareness Presentations for the building and civil construction industries. Dial Before You Dig Qld invites anyone associated with building, construction and civil works to request a FREE Awareness Presentation. This includes: Project managers and officers, Team leaders and supervisors, Engineers and designers, Surveyors, Field staff, Contractors, Machinery operators. In short, anyone associated with work near buried pipe and cable networks. To request a presentation, please fill in the request form under training. how to avoid damage to underground assets. We often hold combined awareness sessions in conjunction with other key asset owning Dial Before You Dig Members such as Ergon Energy, Energex, Telstra and APA Group. 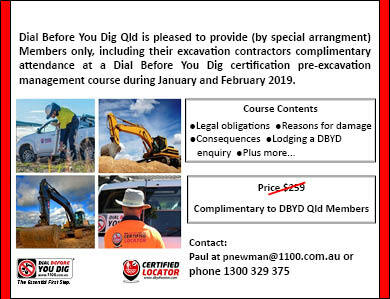 Dial Before You Dig Qld is pleased to provide (by special arrangement) Members only (including their excavation contractors) complimentary attendance at a Dial Before You Dig Certification Pre-Excavation Management Course during January and February 2019.